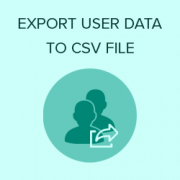 Do you want to export WordPress users data to a CSV file? Sometimes you may need the user data to add into a new website or to use in other marketing campaigns. The default WordPress export tools do not let you export user accounts. 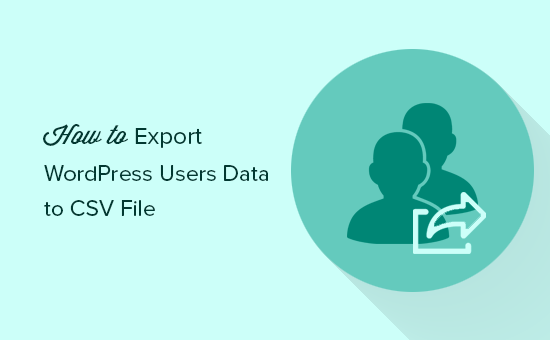 In this article, we will show you how to easily export WordPress users data to a CSV file. The default WordPress export tool does not include user accounts. It allows you to create user accounts during the import, only if those users have content. This excludes user roles with no writing privileges like subscribers or customers in an ecommerce store. If you are moving a WordPress website, then user data will already be included in your WordPress database backup. What if you just wanted to move user data and not the whole website? Many businesses and site owners may want to use the user data in their CRM platforms, email lists, or other marketing campaigns. This is when you’ll need a tool to easily export user data in a CSV file. These are plain text files where each user data field is separated by a comma. CSV files can be opened in any spreadsheet software like Google Sheets, Microsoft Excel, etc. That being said, let’s take a look at how to easily export WordPress users data to a CSV file. First thing you need to do is install and activate the Export Users to CSV plugin. For more details, see our step by step guide on how to install a WordPress plugin. Upon activation, you need to visit Users » Export Users to CSV page to configure plugin settings. Select the user role you want to export or select ‘Every role’. The plugin also allows you to select a date range to download only users who joined between that period. Once you are finished, click on the export button to continue. The plugin will prepare a CSV file containing user data and send it to you as a download. Once downloaded, you can open that file in a spreadsheet program or import it into other programs. That’s all, we hope this article helped you export WordPress users data to a CSV file. You may also want to see our mega list of handy WordPress tips, tricks, and hacks for beginners. this plug-in is no longer available due to security issues. any other free plug-in to do this? Not at the moment but we will certainly look for alternatives and look into updating this article. How can I get a plugin to make a simple CSV list of all of my plugins, with possibly the site where they are found?